Intrinsic Value– The value of an option if it were to expire immediately with the underlying stock at its current price; the amount by which the stock is in-the-money. For call options, this is the positive difference between the stock price and the strike price. For example, let’s say that Dell Computer is trading for $22.50. The DELL 20 call option would have an intrinsic value of $2.50 ($22.50 – $20 = $2.50) because the option buyer can exercise his option to buy DELL shares @ $20 and then turn around and sell them at market for $22.50 thereby generating a profit of $2.50 per share. If we sold the DELL $25 call, the intrinsic value would be zero ($22.50 – $25 = -$2.50) because the intrinsic value cannot be a negative number. Therefore, only in-the-money call options have intrinsic value. 1- Time until expiration– When trading options, time is opportunity. The longer the time frame until Expiration Friday, the greater the chance that the option will finish in-the-money. Therefore, an option buyer is willing to pay more for the increased opportunity and the seller will demand more for the increased risk that the additional time requires him to assume. The time component of an option decays exponentially. Approximately 1/3 of its value is lost during the first half of its life; 2/3 during the second half of its life. –historical– the actual price fluctuation as observed over a period of time. – implied-a forecast of the underlying stock’s volatility as implied by the option’s price in the marketplace. 3- Interest Rates- As interest rates rise, the value of the call will increase. Cash spent on owning the underlying stock is opportunity (interest) lost, thereby increasing the value of the option. 4- Dividends- As dividends increase, call or option value decreases. This is because it is the option seller (who owns the underlying security) who collects the dividend distribution, not the option buyer. As sellers of 1-month options, the main factors that effect the time value of our option positions are time until expiation and volatility. I mention the other two only in the interest of completeness. – Time to expiration decreases…..Call value decreases. – Volatility increases…..Call value increases. – Volatility decreases…..Call value decreases. – Dividends increase….Call value decrease. – Dividends decrease…..Call value increase. – Interest Rates increase…..Call value increases. – Interest Rate decrease…..Call value decreases. The complicated mathematical formulas that determine the precise option premium are not critical to our successful investing. I do feel, however, that having a basic understanding of the components that influence this price can only make us better investors and get us closer to our goal of becoming CEO of our own money. Last week’s economic news….not good! 1- Inflation increases: The Consumer Price Index (CPI) and The Producer Price index (PPI) both rose at a historically high annual rate in June. Higher energy costs including double-digit percentage increases in gasoline prices was mainly responsible for the rise in CPI. The PPI for finished goods which tracks inflation on a wholesale level, showed the largest 12-month increase in the last 27 years. 2- Retail sales increases .1% in June, far below analysts’ expectations despite billions of dollars of recession-fighting stimulous checks issued by Uncle Sam. A major factor in this arena was the 3.3% decline in auto sales. 3- An apparent plus in our economy was the jump in housing starts by 9.1% from their May level. However, this was false advertising since this figure was inflated by the rush to begin construction of multi-family units in New York City before July 1st, when new building codes took effect. The Stock Market can sure use some better news on our economy in order to start heading back up again. Our economy has proven to be resilient time and time again. Why should I think any differently now? At the present time, I am sticking to my strategy of selling predominently in-the-money strikes of the greatest performing stocks in the greatest performing industries. Also note that the Gold and Silver Group which been strong the last few months, lost better than 4% last week. We are entering the height of earnings season. It is critical that you properly factor in Earnings Reports into your investment decisions. Please review DVD I of Advanced Seminar II of the DVD Series, Advanced Seminar II of the Audio CD Series, and and pages 83 to 92 of the Companion Workbbook to properly prepare for the upcoming contract period. On the page opposite the IBD 100 list are the stock sharts. In the middle of MOST charts is a line that reads “EPS Due” with an associated date. This is the projected (but not guaranteed) date of the next ER. When adding a stock from that weeks IBD List, Bob is right on when he says that it is NOT necessary to go to another site for this information. 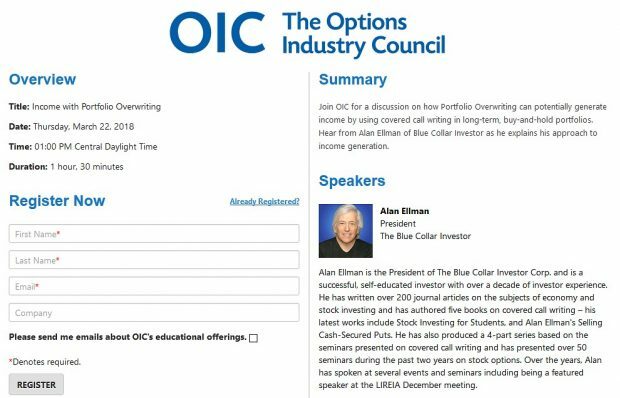 However, when you are looking for an ER date for a stock already on your watchlist or of a security you located from another source, the best way to access the ER information is via one of the free websites I give you in The Cashing in on Covered Calls Products. Thanks to Bob for sharing this point. Note that some of these have earnings coming out between now and July 24 so we are watching and waiting. Quick question. I have 5 stocks with earnings reported between 7/24 and 7/31. Would you recommend selling all of them so I don’t hold them during the earnings release? 1- If I feel real positive about the stock AND IT’S ASSOCIATED INDUSTRY, I may choose to own it throught the ER, without selling the option. I’ve used this philosophy with Apple Computer over the last few years successfully. 2- If the ER is early in the contract period, I may own it throught the ER, let a day or two go by, and then sell this months option thereby getting the best of both worlds. 3- Most of the time, I don’t want to risk the volatility of an ER so I just sell the stock during the 1st week of the contract period and use the cash to buy another equity (not reporting) and sell the option on that one. I have been setting at my computer and a thought came to mind. I am going to do a virtual trad on Wabtec (WAB) one of the stocks on my list and also on your list. Earnings come out tomorrow. I am going to buy 100 at 53.30 and will place a stop loss at 52.80. If earnings are positive and the stock goes up I will profit and also the premium on a STO should also go up. The risk of a bad earnings report would be $50 and I would not be commited further than that. It is a lot less risk than a straddle which the stock must move a lot to even break even. If the stock zooms then I haven’t lost potential profit on waiting to see what happens before placing a covered call write. Is this logical? I thought I would try a couple of stocks on the day before earnings come out to see if it works. Ironically, I just completed writing a seminar I will be hosting for Norwegian Cruise Lines in a few months and WAB was the stock I chose to highlight. You’ve certainly selected a great performing stock in a great performing industry…congratulations for that. Have you factored in the (remote) possibility of a horrific ER causing the price to gap down well below your stop loss of $52.80 thereby causing a greater loss than $50? In my view, there is no right or wrong regarding taking on more risk. Each investor has his or her own level of risk tolerance and need for capital preservation. As you know from my book and DVDs, I am not a big fan of incurring the risk of an ER. My next book addresses this issue in greater detail and I think you will be amazed at the results you can get by managing ERs in a conservative manner. I admire investors such as yourself who are always looking for new and different ideas and thank you for sharing them with us. ALAN, On second thought since earnings come out before the market opens tomorrow morning I should have set a tighter stop at 53.05. Be careful with stop loss orders. They are not an assurance that you will get out at that price. Example: Apple closed 07/21 at $166.50. It announced a poor outlook after 5:00PM. It opened on 07/22 at $149.00. A stop loss set at $163 would have been executed, but not at $163. It never hit $163. It didn’t even wave at it on the way by. The stop loss would have executed at $149. At 2:15PM the stock is back up around $155. One of the most active stocks in today’s trading was ICON (ticker symbol : ICLR),a global provider of outsourced development services to the pharmaceutical, biotechnology and medical device industries. It reported a great ER and announced a 2-for-1 stock split. I will oftentimes add a stock to my watchlist when it demonstrates strong fundamentals, good news, and has attracted institutional interest. There are numerous stories of people suddenly trading the heck out of stock because they got the wrong symbol when they heard a news story. ALWAYS be sure you have the right symbol when making a trade. Jay brings out an excellent point regarding trading volume. I set my criteria at a lower number (250k shares per day, see page 79 of my book, Cashing in on Covered Calls) and ICLR still does NOT meet that figure (it trades on average 158k per day). Avoiding equities with lower range trading volume is another form of risk reduction. Thanks to Jay for bringing out this important point. I JUST FINISHED CHECKING OUT THE IBD 100 AND CHECKING THE EARNINGS DATES. THE EARINING S DATES THAT I MENTIONED BEFORE IN THE IBD CHARTS ARE NOT ACCURATE, THEY ARE OFTEN OFF BY A COUPLE OF DAYS. I CHECKED THEM OUT ON YAHOO TO GET THE CORRECT DATES.